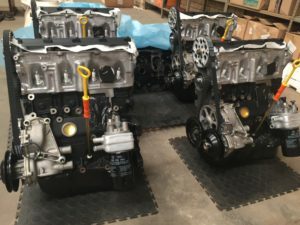 21 December 2016 - Even though delays in finalisation of the chassis detail temporarily slowed production, assembly of the engines in-house by Cantwell Racing Engines has progressed as planned. Changes to the standard 2-litre 8-valve VW four-cylinder motor are limited to fitment of a performance cam-shaft by Vanderlinde Developments, a lightened flywheel, substitution of the standard cam-pulley with a vernier pulley, and implementation of a sealed ECU running an engine control map customised for this application. These brand-new engines will shortly be mated to their new gearboxes & clutches ready for installation into the first batch of rolling chassis. 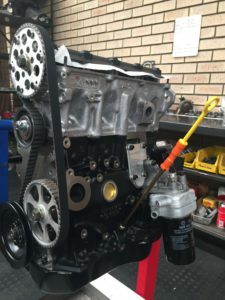 In these images, one engine is nearing completion on its engine stand while four others are essentially complete awaiting fitment of gearbox, clutch, and tappet cover. Behind these lie another six engine blocks awaiting the engine assembler's undivided attention.